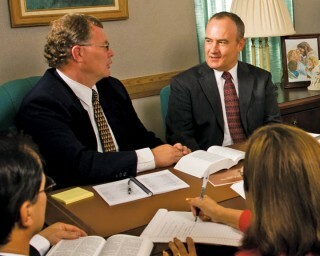 How do Mormon ministers qualify to lead? The Church of Jesus Christ of Latter-day Saints, whose members are sometimes informally called Mormons, is a lay church. It does not have a paid, professional clergy. Instead, all members of the church are invited to serve in callings-church assignments-as chosen by God. Local congregations, known as wards, are led by a bishop. The bishop is a man who holds the priesthood. The bishop has a family and a career, unless he’s retired, and so he is doing this work during his “free” time. This calling, which typically lasts five years, is a gift he gives to God, and is very demanding, since he does nearly everything a full-time pastor might do. He oversees the financial, temporal, and spiritual well-being of the ward, visits the sick, meets with those in need to determine how the church can help, counsels those who are having problems, and leads the program for teenage young men. He has not been through a formal seminary program to learn how to do this job, although training is provided once he’s been chosen for the callings. His real training, however, comes through his day to day life. From the time he becomes a member of the church, he, like all church members, learns his duties to God and works to live them through the best of his ability. He studies the gospel, prays, and builds his relationship with God. Because a Mormon bishop is living in the world, he understands the challenges those in his congregation are facing. As he raises his own family, and learns how to do this according to God’s plan, he is better able to guide those who come to him for counsel. As he goes to work each day and faces the challenges of working ethically in an unethical world, he finds ways to help others do the same. He learns to balance a busy life, and when others come to him because they’re struggling with this, he has first-hand experiences to offer them. The church offers extensive opportunities for its members to learn how to lead, as well as to learn the gospel. Classes begin at eighteen months in the nursery, which is not a babysitting service, but an actual class. After attending the basic service, called Sacrament Meeting, with their parents, they go to the nursery for about an hour and a half while their parents attend or teach classes. During this time, they have a brief age-appropriate lesson on the Savior and His church, a spiritual music lesson, and other educational activities. Children ages three to twelve attend Primary after the service. Here they meet in a larger mixed age group for music and a participatory lesson. Then they go to an age-based class to study the scriptures. Three-year-olds, called Sunbeams, learn about all the scriptures throughout the year. Children ages four to eight, called CTRs (Choose the Right), have a two year rotation, with the Bible taught one year, and the Book of Mormon and Church history taught the next. When they return to a previous lesson book, it is taught at a higher level because they are older. The remaining children, called Valients, have a four year rotation that mirrors that of the teenagers and adults, but is taught at their level. They learn the same portion of scripture as older family members in a given week, so they can discuss it as a family. This rotation includes a year each of Old Testament, New Testament, Book of Mormon, and Church history. Children eight to eleven also have a weekday program. Boys participate in Cub Scouts, and girls have their own program, called Activity Days. In areas where Boy Scouting is not approved by the church, the boys use the activity day program as well. This program allows children to take what they’ve learned on Sundays and apply it in real life. They learn service, practical life skills, and religion in a hands-on way. Teenagers have their own programs. On Sundays, they attend Sunday School, using the four year rotation described above. These classes combine boys and girls, but in a congregation with enough teenagers, they are in classes containing two ages (twelve and thirteen year olds are in one class, for example.) Then they divide by gender and age, and attend either Young Mens or Young Womens. Here they learn how to apply the teachings of the Savior to real life. During the week, teenagers have a weekly evening activity night where, like the Activity Days program, they learn real life skills. Girls work on a program called Personal Progress. Boys continue with the Scouting program, or, if Scouting is not approved for their area, use the Personal Progress program. Each class, consisting of two age groups, has a youth leadership team, consisting of the class president and two counselors. They work under the direction of their adult leaders to create and carry out their own program, and through this, begin to prepare for adult leadership. Youth plan and conduct their meetings, and take responsibility, as far as they’re able, for the well-being of their classmates. Adult leaders use shadow leadership to teach them how to lead. Teenagers also attend a daily religion class, called Seminary, during the school year. This is either held during the school day, or in areas with fewer church members, early in the morning before school. This is an in-depth and academic study of religion and the scriptures. It also follows a four year scripture study rotation, although they study each book a different year than it is studied on Sundays. Adults lead each of the auxiliary programs of the church, and learn valuable leadership skills that serve them both in the world and in the church. By the time a man might be called to be a bishop, it is likely he has held many positions in the church, giving him a good understanding of how the church operates and how to be a good leader. However, because no one is formally trained, and because leadership positions are given to help us learn and grow, members understand their leaders are ordinary people, learning and growing as they do. They aren’t chosen for their resumes, but because God needed them in that position for His own purposes. This knowledge helps Mormons to be patient and loving with their leaders. They learn to love, respect, and pray for their leaders, and to trust God’s choices.